I pull up just as Joel Kelly is unloading a few leftover plants from an old Chevy van. Every week Joel delivers approximately 500 live basil plants from his small urban farm to New Seasons stores around Portland and has recently secured distribution to a number of other stores in the area. The difference between Joel and other urban farmers in Portland, though, is that all his plants grow inside a warehouse. Just a few blocks south of Tacoma Street in North Milwaukee, “Live Local Organics” is an aquaponics farm that occupies a corner of an immense, otherwise empty warehouse next to the dairy giant Darigold. Although aquaponics is nothing new (the Aztecs used it after all), there’s been a resurgence in interest, mainly due to its high yield and greater sustainability as a farming method. In fact, it’s these qualities that Joel hopes will help launch his agri-startup into an important supplier of organic, local produce to the Portland metro area. Tall, lanky and with a friendly demeanor that instantly puts you at ease, Joel eagerly leads me through the dark cavernous building to the corner he currently leases that contains nine waist-high trays, each 40’ long and 8’ wide. It is a sea of deep green genovese basil in different stages of maturity and the whole scene—PVC pipes, overhead lights, and gurgling pumps—resembles a science project as much as it does a farm. I marvel at the sheer number of plants around me as Joel checks one of the water tanks and explains to me the system’s benefits. “Because the roots don’t work as hard to find water and nutrients, we get a mature basil plant in around five weeks where in soil they would take at least seven or eight [weeks].” He also explains how he uses only a fraction of the water required in traditional farming and doesn’t use pesticides or artificial fertilizers “because they would harm the fish.” On top of this, he says he’s working with a green energy specialist to incorporate solar and other technologies to make the farm less dependent on fossil energy. A combination of hydroponics (water-based planting) and aquaculture (fish farming), aquaponics is a virtually closed system of food production, and with the right space and equipment it can be done almost anywhere. On top of growing and harvesting the plants, managing the fish, making the sales and deliveries, and everything else that goes into running a small business, he’s in the process of expanding as well. Right next to the warehouse space he already occupies, he’s building a second aquaponics system, this time with two levels, allowing him to grow twice as many plants with the same footprint. He’s focused on basil at the moment because it is the most profitable and easiest to grow, but he’s been experimenting with other herbs and vegetable plants like eggplant, tomatoes and peppers and hopes to offer a variety of produce soon. He no doubt has big plans, but he’s very clear about his mission being a local one. He sees Live Local Organics as a consistent, sustainable supplier of healthy food grown in the city and for the city. 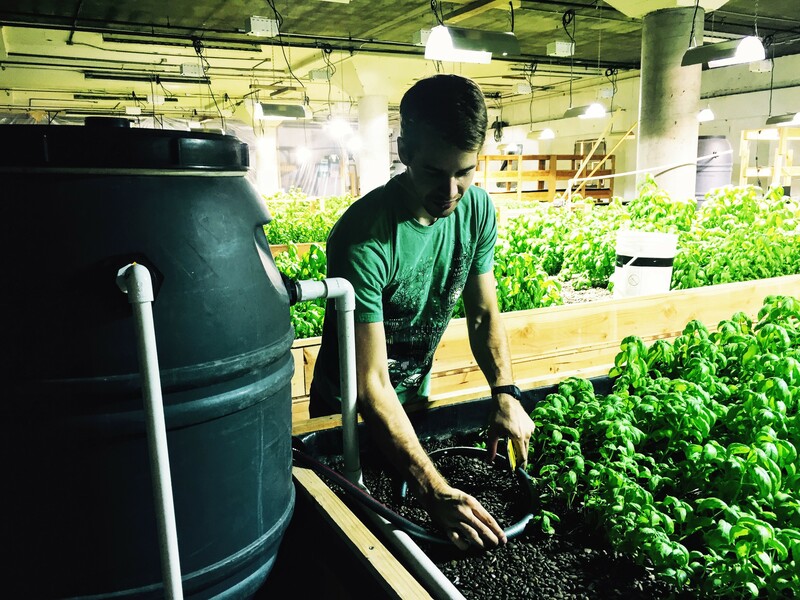 He explains how he believes his farming model is one that can be easily replicated and that a number of small aquaponics operations like his, dispersed throughout Portland, could play a big part in sustaining the city year-round. He’s even developing an educational side to the business, which will use the farm to teach others about aquaponics. For now, though, he just likes sharing about what he’s doing and he said visitors are always welcome. After the tour Joel and I grab lunch at PDX Sliders, a local food truck. As I bite into my Chicken Morrison, Joel smiles confidently. ‘Sliders’ is one of his clients, and the pesto on my sandwich happens to be made with his basil. After devouring my meal I can’t help but agree with Joel’s other happy customers. It’s delicious! 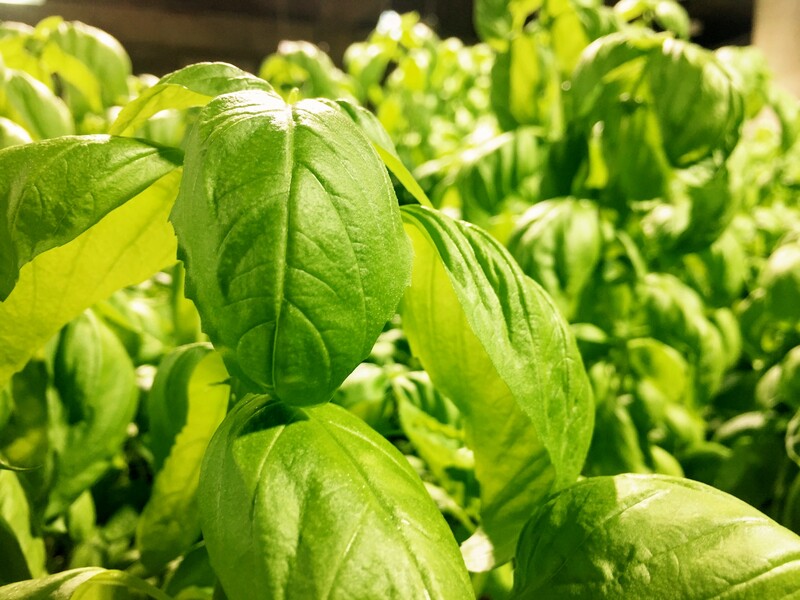 Live Local Organics basil is available on Ripelist. Feel free to get in touch with him through the app and check out his farm! Next Post → Is ‘Farm to Table’ No Longer Relevant? that is amazing! Who says ” we can’t feed the whole planet”? Joel’s aquaponics farm is truly the wave of the future. I’m real excited to follow his progress. I’m going to the store right now to purchase some basil. His product is way beyond organic. The fish are fed organic food, the water they swim in is the only fertilizer touching the plants, and it is filtered as it goes through the bed. After that it goes directly back to the fish and the cycle starts over again. Got to go get my basil now. I love Live Local Organic’s Basil. It tastes fresh and much more lively than other brands of basil. Always keep it stocked! Joel has got it going on. He is at the right place at the right time. He works so very hard and always has a smile. Great article.